Cookie development IS full steam ahead! and supports all the popoular browsers. There are known compatibility issues with SafariStand, and Saft. 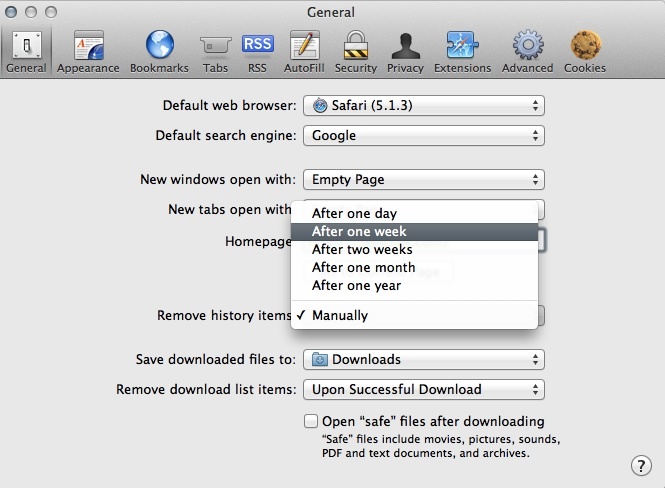 You may need to uninstall these first, before installing Safari Cookies. Its really up to you what you think Safari Cookies is worth - personally i think a donation of $10 - $15 is a fair amount. November 04, 2010 - Version 1.6.3 - Safari Extensions database management, better flash cookie support, small code cleanup/optimisations, upgraded SIMBL install to 0.9.8c - use a custom install to upgrade SIMBL when upgrading Safari Cookies. 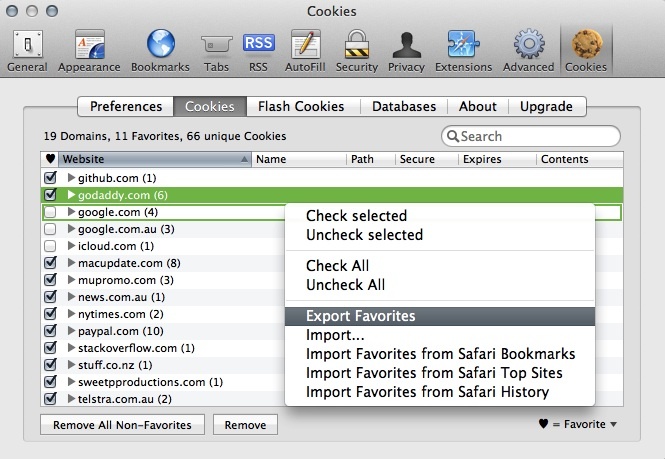 October 26, 2010 - Version 1.6.2 - fixed display of multiple cookie domains, upgraded installer to SIMBL 0.9.8 for both Leopard, and Snow Leopard - use a custom install to upgrade SIMBL when upgrading Safari Cookies. September 06, 2010 - Version 1.5 - Added the ability to configure "Automatic Mode"
July 04, 2010 - Version 1.4.4 - fixed an incompatibility with SafariSource, thanks Kevin Ballard. October 10, 2009 - Version 1.2 - Added Automatic mode, added option to "import Favorites from Safari History"
September 26, 2009 - Version 1.0 - 64bit compatibility, Now uses SIMBL to inject code into Safari, Added Sparkle automatic updating, Added "Check All", "UnCheck All" as Favorites options, Added "Import Favorites from Safari Bookmarks", Added "Import Favorites from Safari TopSites", ****Removed Logging feature - it wasn't 100% accurate anyway, Moved all Favorites management to contextual menu, "About" panel corrections, French localization corrections, UI tweaks, Fixed bug where if there are no favorites checked - checking favorites within a search/contextual-menu is not honored, Fixed sort order and other issues for some special case cookies, Fixed display of IP addresses, Fixed default settings, Built using XCode 3.2, Replaced some deprecated functions. 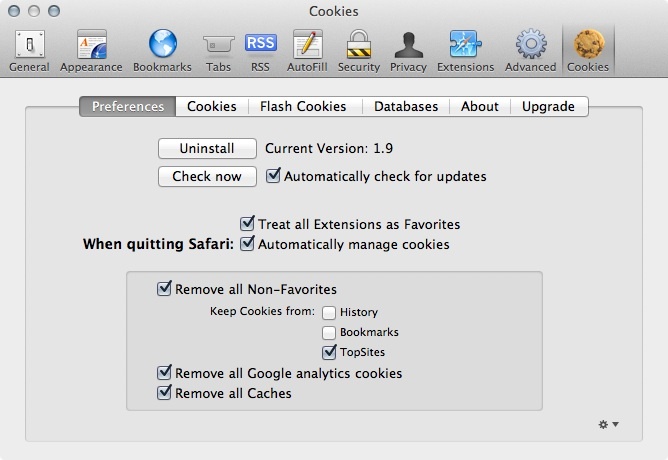 Install Safari Cookies from the installer, and access preferences through Safari's preference menu. When exporting favorites, only the domain "names" are exported, not the actual cookies. 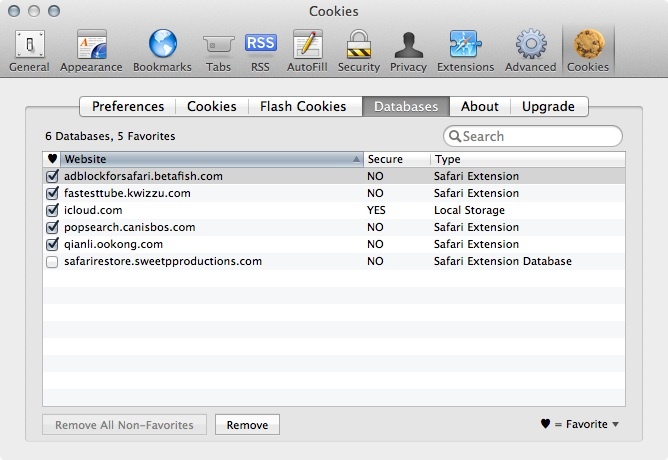 Safari Cookies was built using source code from SafariPlus (Creative Commons license), and uses SIMBL to inject code into Safari. Source-code is available here under the new BSD License.